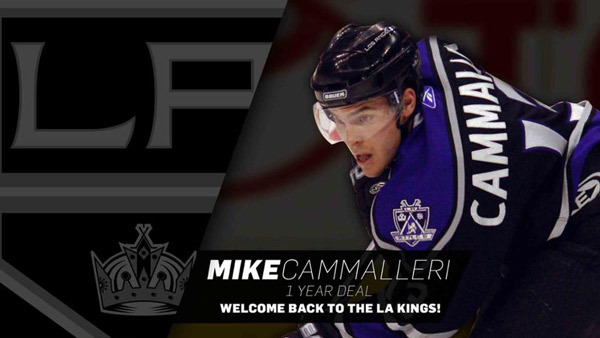 The Los Angeles Kings have agreed to terms with unrestricted free agent forward Michael Cammalleri on a one-year contract, Kings Vice President and General Manager Rob Blake announced on July 1. The AAV for the contract is $1 million (plus bonuses). The 35-year-old Cammalleri (born June 8, 1982) is a 5-9, 185-pound native of Toronto, Ontario who appeared in 61 games during the 2016-17 season with the New Jersey Devils, posting 31 points (10-21=31) and 21 penalty minutes. Cammalleri, who made his NHL debut with the Kings during the 2002-03 season, has scored 20-or-more goals six times, and 30-or-more goals twice during his NHL career, highlighted with a career high 39 goals with the Calgary Flames in 2008-09. He scored 79 goals and collected 182 points for Los Angeles from 2005-2008, highlighted by a 34-goal, 80-point season with the Kings in 2006-07. In 283 career regular season games over five seasons with the Kings, Cammalleri registered 93 goals and 205 points (93-112=205), with 55 of those goals on the power play. Drafted in the second-round (49th overall) by the Kings during the 2001 NHL Entry Draft, Cammalleri has appeared in 840 regular-season games during his 14-year NHL career with the Kings, Devils, Flames and Montreal Canadiens. He has recorded 287 goals, 613 points and 407 penalty minutes during his career (287-326=613), and he has 102 career power play goals. Cammalleri has recorded 32 points (17-15=32) and eight penalty minutes in 32 career playoff games.